WASHINGTON, D.C., January 04, 2013 (Zenit.org) – Another employer in the United States has succeeded in moves to stop enforcement of the controversial HHS mandate by filing an emergency motion for a Temporary Restraining Order (TRO) on the grounds of the mandate’s violation of the employer’s First Amendment religious rights. The Health and Human Services (HHS) federal mandate requires employers of religious institutions to be legally required to pay for insurance that provides abortion-inducing drugs, contraception, and sterilization procedures to employees. Dominos Pizza founder Tom Monaghan won the bid for an emergency order to stop enforcement of the heavily opposed mandate. The mandate, which is part of the Affordable Care Act and took effect Jan. 1, 2013, also requires employers to educate their employees on using such drugs. Monaghan is also founder of Ave Maria University and Ave Maria Law School. There are now 40 separate lawsuits challenging the HHS mandate, including suits from Hobby Lobby, Wheaton College, East Texas Baptist University, Houston Baptist University, Belmont Abbey College, Colorado Christian University, the Eternal Word Television Network (EWTN), and Ave Maria University. Before Christmas, another pro-life victory took place when Priests for Life won a legal battle to get an exemption from having to comply with the mandate. It was still very dark. I had my flashlight and the frequent street lights to guide me. 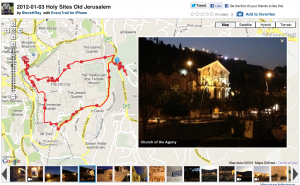 I decided to take you all on an early morning walk to see many holy sites in and around the Old City of Jerusalem. I even arrived at the tomb of Christ early in the morning like Mary Magdalen. Some of our pilgrims were at Calvary and the tomb so I showed them around a bit. With this walking tour you will see much of Jerusalem and many of the holy sites as though you are walking along with me. I used a lot of videos to give information, perspective and to make it as much of a real experience for you as possible. Enjoy!